What’s included: Machine body, 5 replaceable filter, adapter, 1 sponge + 1 additional sponge, user manual. 10 reasons why Lourdes generator is hydrogen water machine №1. 1. Lourdes generator produces water with high hydrogen (H2) concentration of 0.9-1.2 ppm. 2. Lourdes generator produces hydrogen rich water employing an advanced PEM membrane that allows water to be enriched with high concentrations of only pure molecular hydrogen (H2). There is NO formation of electrolysis by-products such as ozone, oxygen, chlorine. 3. Lourdes generates water that keeps useful concentrations of hydrogen (H2) for more than 72 hours in standby mode. 4. Hydrogen rich water produced by Lourdes generator will maintain high concentration of hydrogen (H2) even while being stored in glass or plastic bottles. No need for expensive aluminum H2 bags. 5. 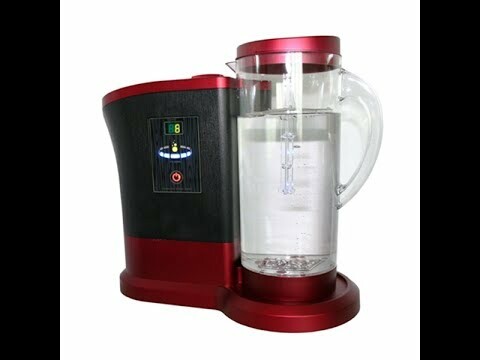 Generated hydrogen rich water has a neutral to slightly alkaline pH of 7-8 and is suitable for use by people of all ages. 6. The Oxidation-Reduction Potential (ORP) of produced hydrogen wateris greater than -600 mV. 7. Lourdes generator is easy to use. 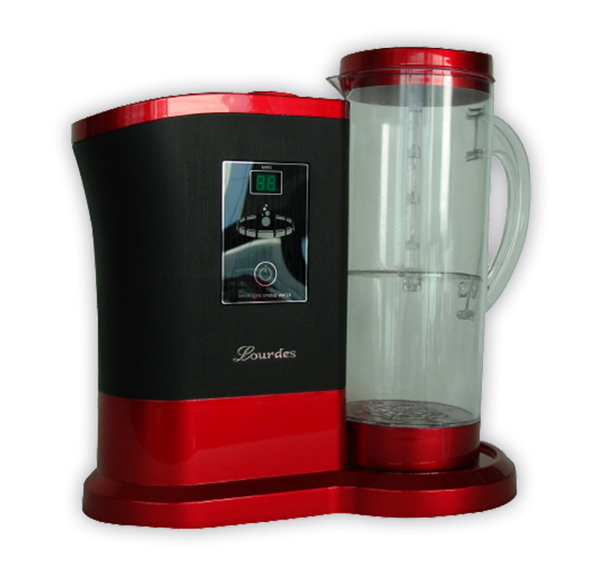 It contains a modern LCD screen, 2 buttons and 2 indicator lights showing the selected mode (hydrogen or sterilizing water). 8. Lourdes generator does not require connection to a water line which adds to its portability. 9. Even distilled or reverse osmosis water can be transformed to highly concentrated hydrogen water by Lourdes generator. 10. Sterilization mode generates sterilizing water enriched with ozone, hypochlorous acid and chlorine peroxide. Ozone kills more than 99% of viruses and bacteria in less than 5 seconds, while being a safe method of disinfection and purification. Sterilizing water will easily help to clear fruits and vegetables from harmful chemicals, and also to maintain cleanliness in the home or office. Due to latest technologies and high-quality Lourdes generator produces high concentrations of hydrogen of 0.9-1.2 ppm in a short time which has led to it being the most in demand among hydrogen generators. Lourdes is an advanced generator with PEM membrane that allows the use of distilled and reverse osmosis water with pH less than pH7 (slightly acidic) and low in minerals. This option is not available to many other hydrogen generators with regular electrolysis. Lourdes generator easily converts water into hydrogen water with neutral pH 7-8. This water is suitable for people of all ages and health conditions. Special patented technology used by Lourdes generator allows the production of large amounts of dissolved hydrogen that remains in the water more than 72 hours in stand-by mode. Hydrogen concentrations stay high for more than 24 hours in class or plastic bottles. No need for special aluminum H2 bags to take hydrogen water for all day use. Lourdes uses PEM membrane to generate hydrogen rich water. Hydrogen is generated continuously in the base of the jug by two titanium and platinum electrodes, separated by a patented membrane. Hydrogen and oxygen are isolated and only hydrogen (H2) passes into the water . This ensures that drinking water is enriched only with a high concentration of pure molecular hydrogen (H2) without the formation of electrolysis by-products (O2, O3, Cl2). How does Lourdes hydrogen water generator work? As a useful addition, Lourdes generator is also equipped with the production of sterilizing water. This water is enriched with ozone, hypochlorous acid and chlorine peroxide and has the properties of sterilization, purification, antibacterial and antiviral effect. It will easily help you to clean fruits and vegetables from harmful chemicals, and also to maintain cleanliness in the home or office. For high-quality durable use, the electrolysis tank of the Lourdes generator is equipped with a replaceable filter. It needs to be changed every 6 to 7 months on the basis of 6 L per day of hydrogen water generation. Buy Lourdes generator filters here. Maintainance of Lourdes generator is very easy and does’t take a lot of time. Cleaning with “Sterilization mode” needs to be done once a week. Fill half of the Lourdes pitcher with water and press button “O”. After 15 minutes timer will automatically stop. Pour out sterilizing water and rinse pitcher. Lourdes generator transforms regular drinking water into high quality hydrogen water with therapeutic properties.